A road movie about her last tour. Re: "Nico, 1988" new movie. At least that trailer looks better than this one, which isn't anything like any of the Nico gigs I went to in the 1980s. Tonight, i'm gonna see this movie, with a concert at the end. All VU-music. In Amsterdam, Paradiso. A classic location. Tell us how you liked the movie. Loved the movie, it's about the last two years of Nico, touring. It's based on the book, I would say. And an nice little concert at the end. Thank you very much for sharing your impressions! How was the "Nico"? "Nico" in the concert afterwards was, Carol van Dijk, singer from "Betty Serveert" I do think she did an great job, but her voice could use a little more volume, over the PA. And there were free buttons, i've took two home. 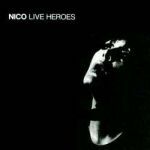 And "Nico" in the movie also was nice to listen too, soundtrack will come on cd, i think, because the were giving one free vinyl-album away, before the movie.